It's Friday and so it's time for Free Friday.. Catch the bug.. This is the cute Free Friday Image... Button Bear.. You can find the image in the Bugaboo Store. Today I broke out a bunch of dies and just went for it.. I first cut the hills with Simon Says die.. I cut and colored the dogs (with copics and added black enamel accents to the nose and eyes and bling to the collar) by My Favorite things.. When I went to add them the background but it was just too plain.. hum what to do.. so that's where I went through my dies because I couldn't stamp anything behind there.. I found these cute houses from Clovis and the trees are from Simon Say.. I first softly colored the sky to look sunny and adhered the houses and trees. Now I have a fun neighborhood and fun little dogs.. Welcome to a Tuesday New Release at Catch the bug.. This is an old image that has been around for a long time.. Jodie has been changing the Bugaboo Store to another program so she is coming up with some OLD and forgotten images that people may like. 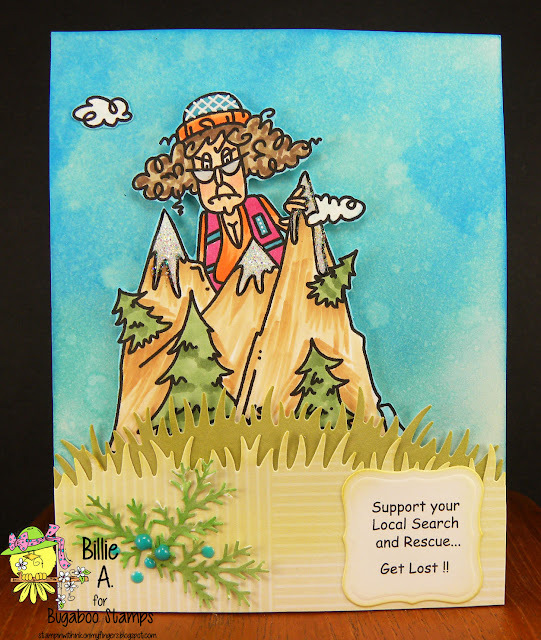 This is the image called Stella peeker Search and Rescue.. You can find it in the Bugaboo store. I wasn't sure what I wanted to do and then I just got the Lawn Fawn grass hill dies yesterday.. I had to use them.. I fussy cut out the image and colored with copics.. I then used Ranger inks and did the blue sky background and spritzed with water. I adhered the image with foam tape to the sky and added the little cloud that I cut out from the whole image and applied to the left side I then used two different green papers and die cut the grassy hills. I added glossy accents to the mountain top and sprinkled with glitter so make it look like snow.. I added some glossy accents to Stella's glasses. 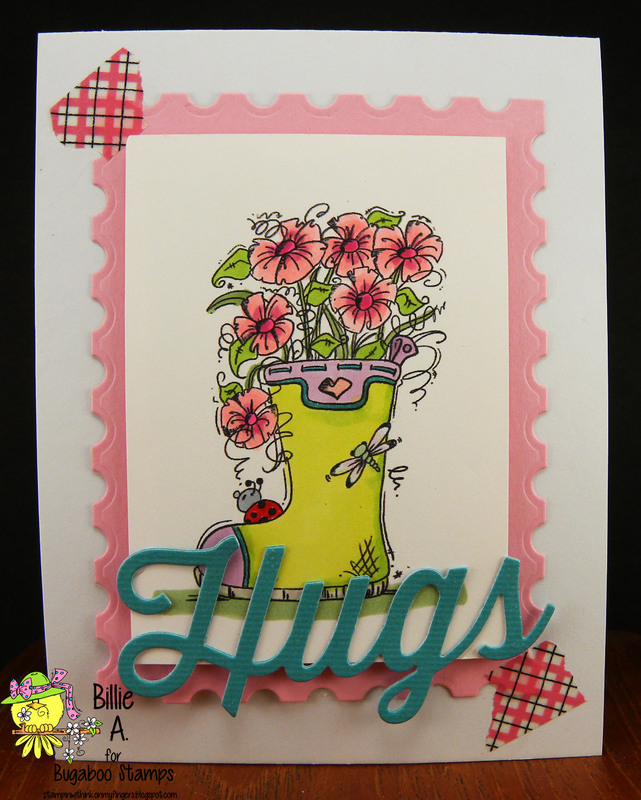 I used a Spellbinder die and cut out the sentiment. I took some MS punched ferns and added them along with some Nuvo drops. I added some white gel pen to her hat and vest. Today I have a card I made just for fun.. I have been following and playing along at The Daily Marker. Kathy Racoosin has a month long color challenge every few months.. 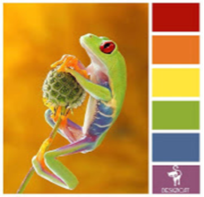 It's where you color and learn ..well at least for me, I learn from her postings. She does videos or a grouping of photos of her work in progress. Most of her color techniques are using Copics and colored Pencils. I love the effect it gives and added colors. Most days I have posted something I've done on her blog challenges. I try to color every day. Well like I said she does the pencil/copics so I gave it a good try with my card below. There has been a time in the past where I used just one color pencil with copics but not so much for added interest but for a one color simple area that I just didn't have a copic for.. Any how this is the card I did.. The large and med flowers are from Spellbinder as well as the leaves.. The large blue flower I colored with light blue copic the rest of the colors are colored pencils. The medium flowers I colored with orange copic and the rest of the flower is with colored pencils. The leaves are colored with an yellow/green copic and the rest with colored pencils. The crocus looking flower are from Simon Says and I colored with a light purple and the rest of the colors are with colored pencils. I finished the flowers and leaves with white gel pen. 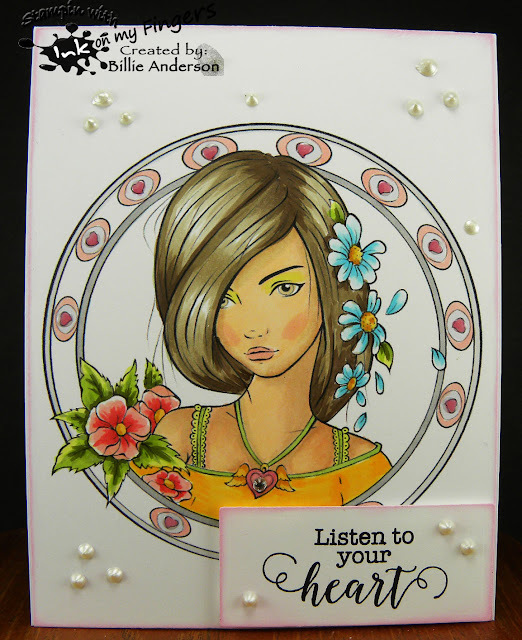 The background is a Tim Holtz stencil and ranger ink. The Hello is a My Favorite Things die. 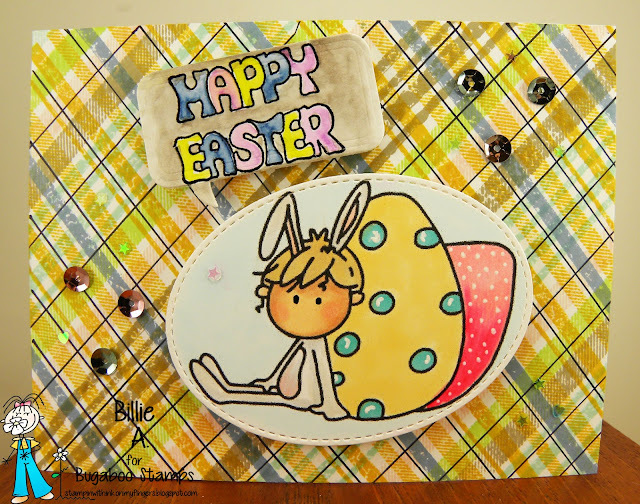 I used Spectrum Noir glitter pen and to finish the card I rounded the corners with my corner chomper. So what do you think?? I know I need to practice a lot more and I have stamped different images to practice on and if they come out ok I will make into cards for future postings. It's sure been fun learning and creating. This is my card using the image AKV butterflies you can find the image in the Bugaboo store. I was lucky enough to find background designer paper that had most of the colors. I added more of the colors with the tags from Tech. Tuesday and My Favorite things hello die.. The scallop edge is Reverse Confetti.. I love this die. It comes with a few different styles. I hope you play along and I have inspired you. If you need more inspiration look at what the DT did at Catch the bug. 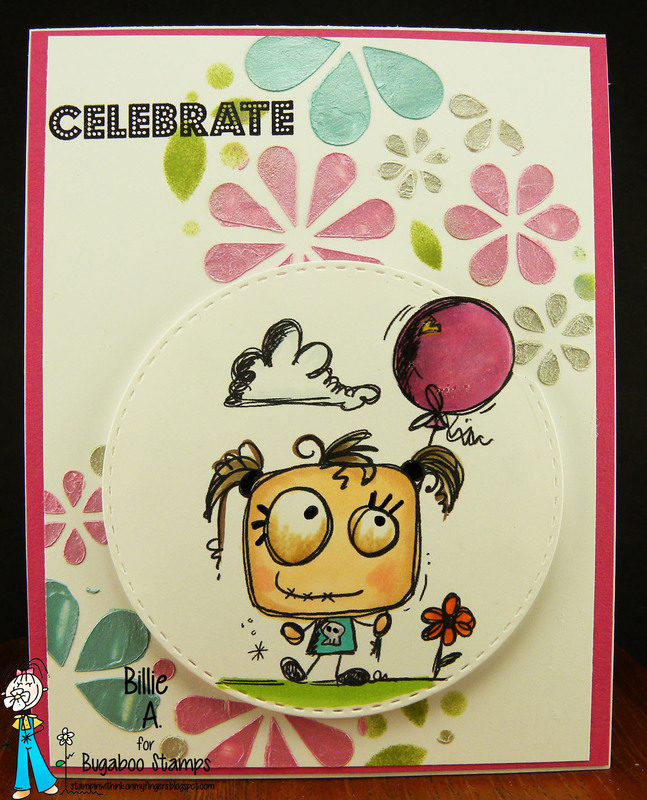 This is the cute Free Friday image called Izzy Balloon you can find the Free Friday at the Bugaboo Store.. 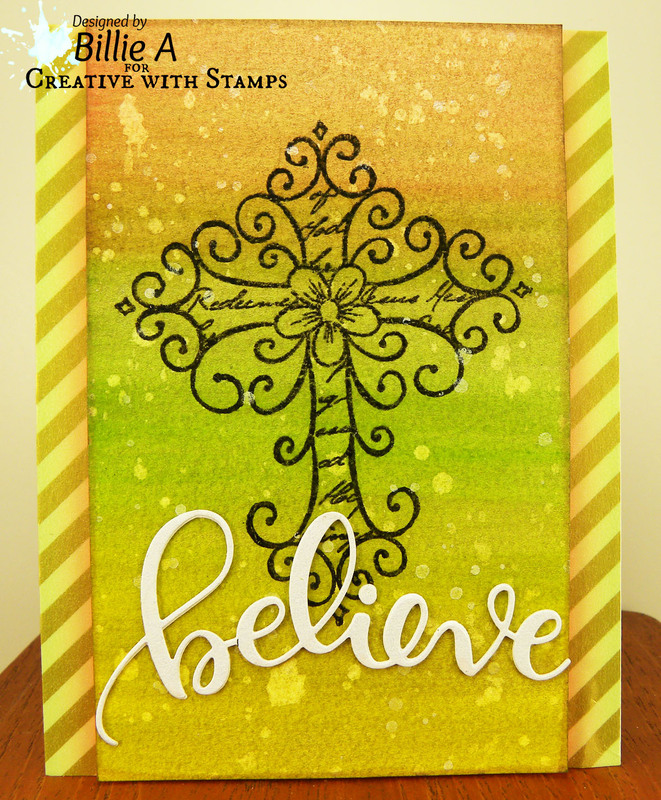 I used the stencil that came in the Simon Says Monthly kit and the Nuvo paste and made the background. It's suppose to be an egg.. but I thought it would work for a simple background. Those Nuvo paste colors are stunning. The green is ink sponged in the leaf area.. I die cut the image with Simon Says stitch circle die. I colored her with Copics and used glossy accents on the balloon. The sentiment is from Your next stamp. This is a very spring feeling card. Check out what the design team did..
Well its almost the end of March and weather is finally feeling like spring.. Love the warmth, colors and smells in the air.. Hope you have a great spring. ALSO MAKE SURE YOUR SENTIMENT IS SEEN.. I am using the image called I miss you.. I planned on making this card a circle card but the dies were just a smidge too small and I did not want to print it out again... so I made it like my usual cards. A-2 .. I colored her with copics and added a sentiment that I had on my table.. I think it's from Stampin up. I used glossy accents on the hearts in the border and around her necklace. I used Quick Quote pink ink to distress the edges. I added a gem to her necklace. 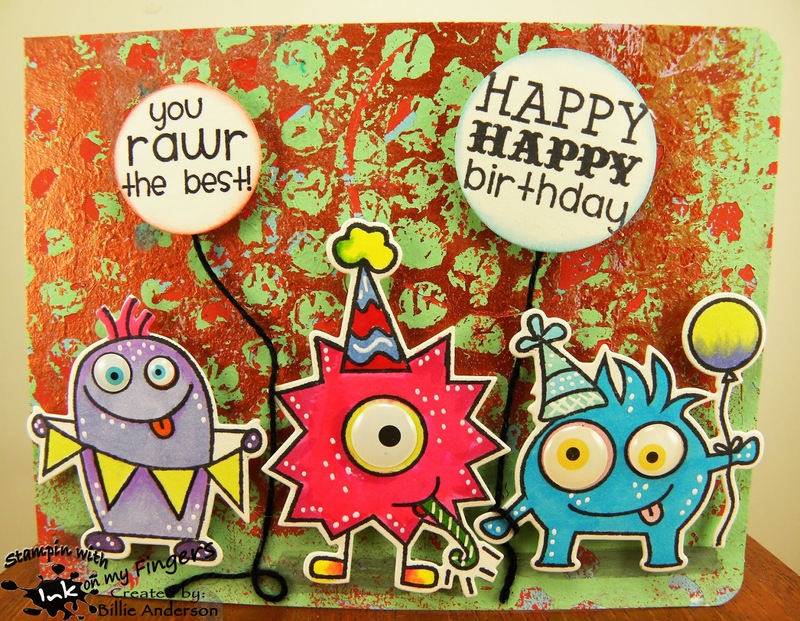 Around the card I added Nuvo drops. Check out the cards the DT made.. You'll be inspired.. I seldom do paper piecing... so when I saw this was the theme.. Humm what will I do??? So digging through my stamps I saw this fun Simon Says stamp set.. and thought perfect.. Instead of just paper piecing the pillows. I thought why not.. lets paper piece the cat and dog.. Aren't they cute? I had the kitten head also in the print but you just lost the face so I stamped the head on a plain cream piece of paper. I found a lighter color tan for the dog and stamped his head. The head are adhered with foam dots and the body also is so they are extra thick. I used various straps of paper for this whole card. I did use a little copic coloring to the heads to give it more depth. You always hear how kittens are like a queen.. so I thought the EK crown punch was a nice touch. (I don't have cats because I am allergic to them but I love seeing videos and photos of kittens and if I wasn't allergic I know I would have one or two) We do have two dogs, they are hair dogs so I am not allergic to them. :) The hearts are EK punch and some left over from other projects.. most likely Simon Says. I like how it came out.. 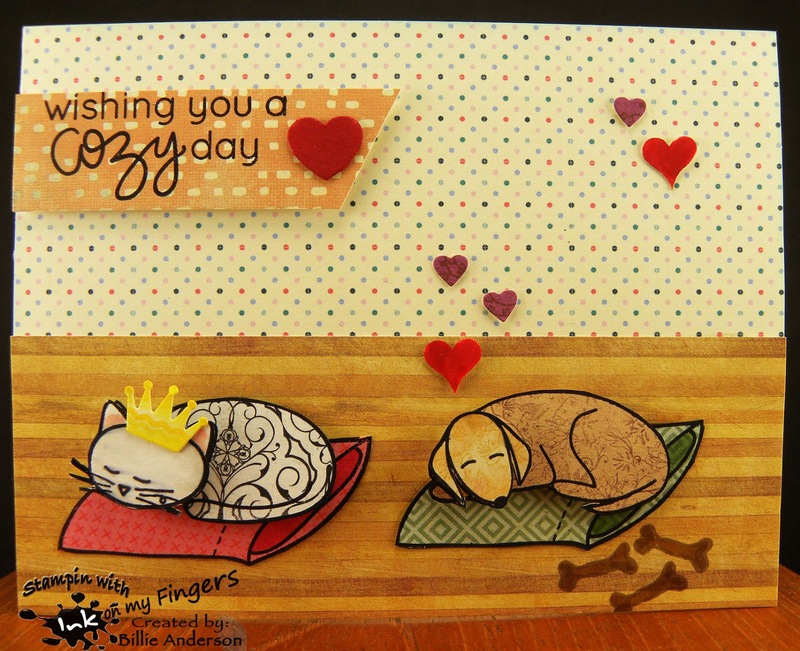 I hope you play along and I cant wait to see what you have created in paper piecing. It's Tuesday so that means it's New Release day at Catch the bug.. The images can be found in the Bugaboo Store.. This is the cute little guy.. Called Wee One Easter Bunny Boy. I am not one to make Easter cards but this just had to be.. 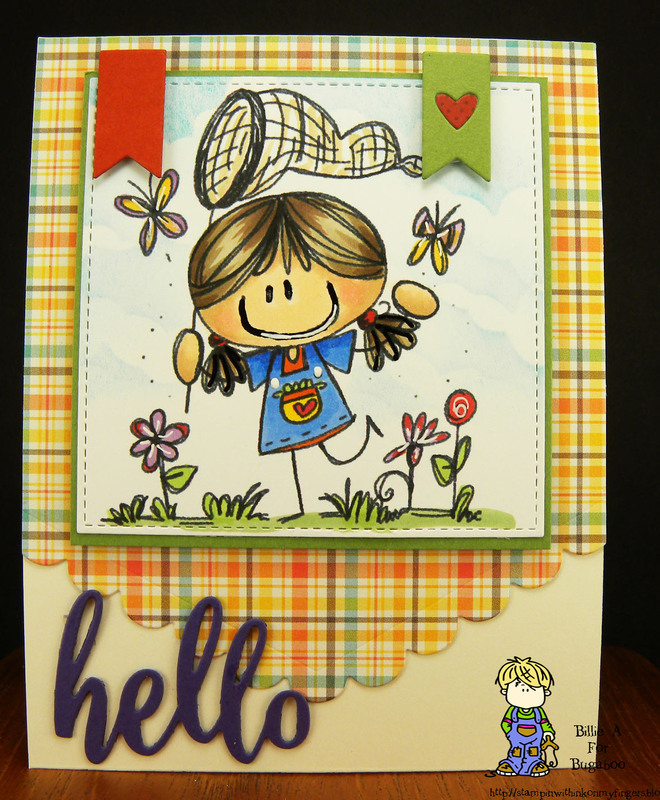 I wanted a plaid background so took out My Favorite Things stamp set which makes it easy to make plaid.. it's just getting the right color combo... I have issues with this but when I was done stamping (I used Ranger inks) I took a black sharpie and drew lines. I liked it better once that was done. I then took the Simon Says word bubble and stamped Holly Berry House sentiment and colored with Zig markers. I tried to make the background the brownish color from the plaid.. It came out dirty looking (at least to me it looks that way).. I colored the image with copics and die cut from My Favorite Things stitched oval. I used a white gel pen on the eggs. When the image was mounted I added some sequins and some small stars and heart sequins. They are really hard to see but they are there. I hope I have inspired you to get this cute image. oops I think I posted 12 hr. too soon.. 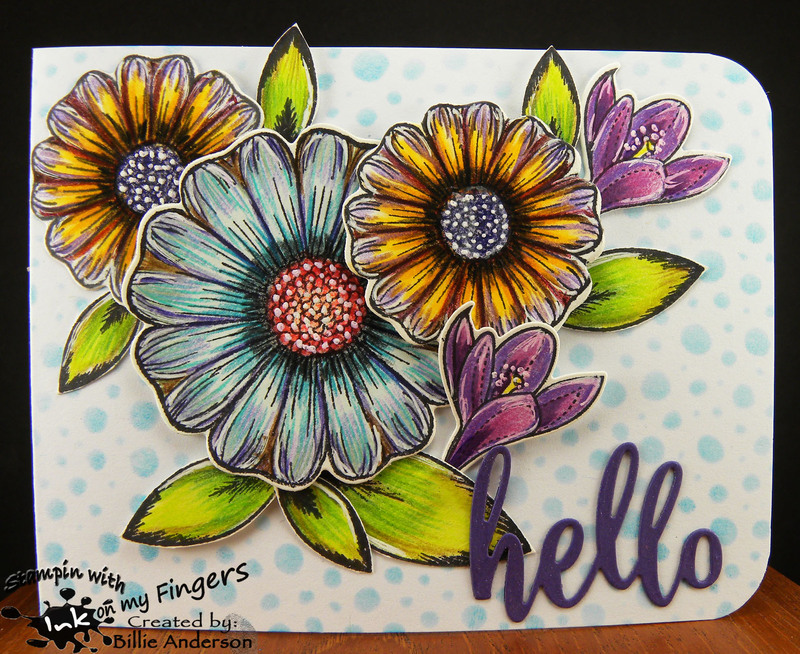 I hope you head over to Monika's blog Creative with Monika and see her monster card.. She has really helped me think more on making my own backgrounds vs. DP.. I like the idea .. but I do love my DP.. Welcome to another challenge at Catch the bug - BINGO.. This image is called Kidz 1 which can be found at the Bugaboo Store.. Isn't she just the cutest.. 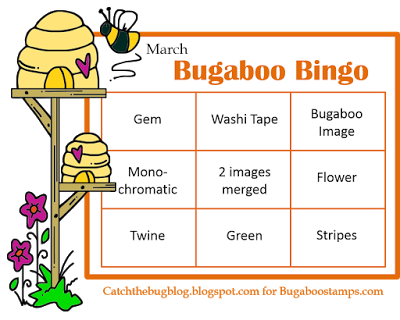 I chose the last row.. Bugaboo image/flower/stripes... I used Lil Inker stitched die to cut out the pieces. I added a little washi tape to the two corners just because. I added some Martha Stewart leaves and Stampin up punched flowers to the bottom corners along to some gems to the inside of the flowers. The image is colored with Copics and added some white gel pen for accents.. Oh the sentiment is from Simon Says. Welcome to another Catch the bug FREE FRIDAY.. This is the Free Image.. It's one of my favorites.. I have used it before. 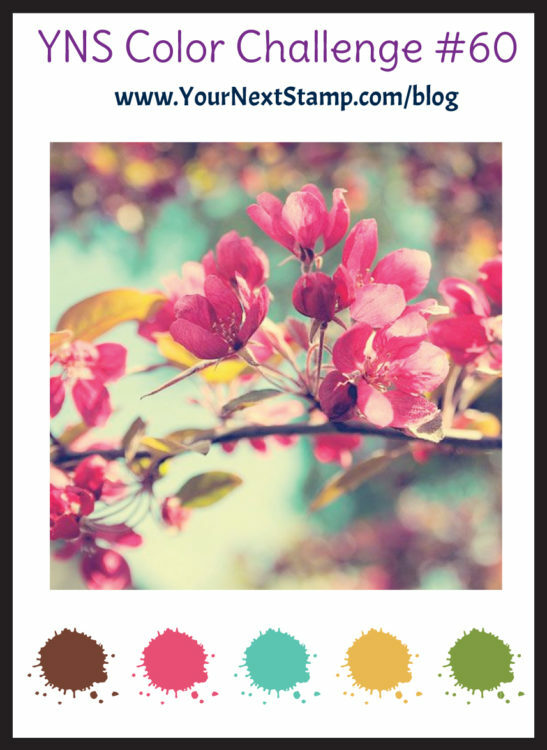 It's a great spring / fall image and there are so many color combos.. I am not a pink person but I saw this Postage Frame that Monika sent me.. (thank you Monika) and so went with it.. I used washi tape in the corners. and die cut My Favorite Things Hugs. It was a very simple card to make. Oh I colored it with copics The boot looks yellow but I used Yellow/Green YG21.. I love that color and added some Noir pen for some shimmer. Creative with Stamps #12 EASTER theme. I hope you have time to play along. We have lots of beautiful cards added to the challenge blog and hope you are inspired by the entries and design teams creations. Play along and have fun. Below is the challenge graphic that needs to be added to your blog list where you show what challenges you are entering. Please add it if you are adding a card so you can possibly win the challenge. As I said on March 1st.. I don't send out Easter cards but I thought it doesn't have to say Easter but a card that could be used for Easter or any other reason.. This awesome cross is if I remember right from Spellbinder.. The die is from Simon Says.. I love the word Believe.. in fact I have a white tattoo on my inside left wrist ...Believe.. I took some watercolor paper and embossed the cross in black embossing powder then took my Kuretake Gansai Tambi paints and three colors and did the background. I let it dry, then I took some water and splattered it on the watercolor piece and blotted it up. Then took Mr. Huey's calico shine and splattered it over the card. I was searching for the right card base color or background card stock color to add the design piece to but was not finding the right piece.. Then thought of my Washi tape - low and behold there was the perfect piece. So I lined both sides of the card with this awesome Washi tape and then used some foam adhesive to raise the cross card piece. I am loving this card and look.